Recipe submitted by Lisa Klauser, VP, Building Brands with Customers, Unilever. 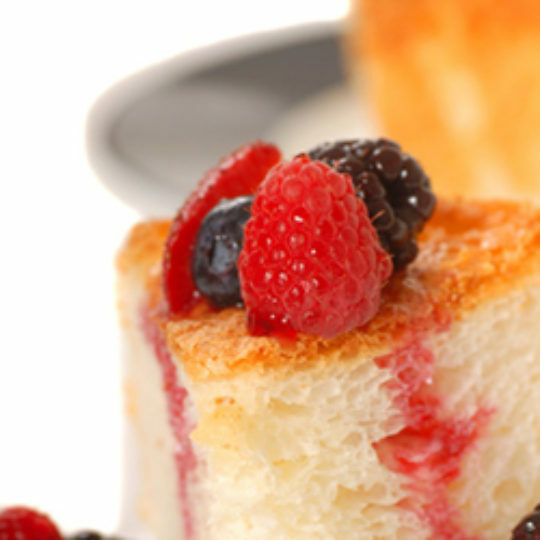 This homemade angel food cake has straight-from-the-oven taste and warmth. Fresh raspberries top this wonderful cake and sticky raspberry sauce runs down the side. Your guests will think you're an angel if you serve this cake! Or bake it tonight and make an ordinary dinner with the family heavenly! Place egg whites in a large mixing bowl and let stand at room temperature for 30 minutes. Sift cake flour and 3/4 cup plus 2 tablespoons sugar together twice; set aside. Beat egg whites with cream of tartar, extracts and salt on medium speed until soft peaks form. Gradually add remaining sugar, 2 tablespoons at a time, beating on high until stiff peaks form and sugar is dissolved. Gradually fold in flour mixture, a fourth at a time. Gently spoon into an ungreased 10–inch tube pan. Cut through the batter with a knife to remove air pockets. Bake on the lowest rack for 30-35 minutes or until top springs back when lightly touched and cracks feel dry. Immediately invert baking pan; cool completely. Run a knife around sides and center tube of pan. Invert cake onto a serving plate. Puree berries in blender with lemon juice. Add sugar 1 tablespoon at a time, to taste. Strain puree through a fine strainer. Spoon sauce onto plate, add cake slice, then spoon additional sauce on top.